You can customize output styles with the Output Style Editor. This is not an easy process, but custom output styles can be very useful when you want, for instance, to output annotations with your citations. An Output Style is any combination of in-text citations, notes (footnote or endnote) and a bibliography. You have to set up each section that is appropriate for your desired output. You can choose an exiting Output Style to modify or create a new one. Once you save a custom Output Style, it will show up in RED in your list of favorite styles. The Settings: There are settings for the Bibliography, the In-Text Citations and the Notes that determine line spacing, headings, sort order, etc. You determine the settings for each area as necessary. The Format: Each of the three areas (Bibliography, In-Text Citations and Notes) can have defined formats where you decide exactly which fields of information are used, the order of the fields, as well as any punctuation, spacing and text attributes for every reference type you need to have for your final output (i.e., a book, a journal, a web page, a dissertation, etc.). All of these items need to be considered when creating or modifying a style. Sorry, there's no video on this topic. 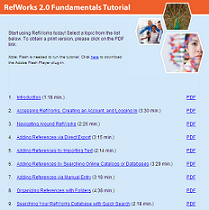 But check out the Refworks 2.0 help sreens for info on editing output styles.